Jason Silverman's serving bowl is part functional piece, part serene ocean-inspired sculpture. Imagine floating on the ocean beneath a star-strewn sky. Ahhh, the serenity. Jason Silverman captures the colors and sentiment in his beautiful serving bowl. He crafts each from porcelain, pressing a subtle yet mesmerizing swirl into the bottom of the basins. Next, he paints the raw clay with striking glazes that melt and flow together in the kiln. 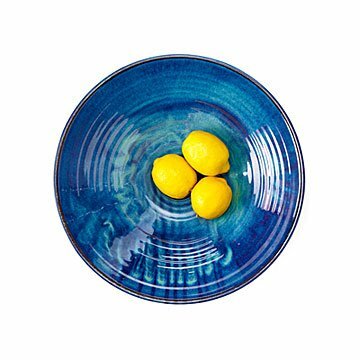 An elegant centerpiece or fruit bowl, the design makes an impressive housewarming or wedding gift for ocean lovers. Handmade in Pennsylvania.